Update 4/24/16: Thanks to everyone that attended this event. We enjoyed an informative evening with nearly 100 guests, including descriptions of the Baja Divide and the planning and equipment required to make a successful tour of the route. Thanks to The Bicycle Shop, Dimond for hosting the event, as well as Revelate Designs, Advocate Cycles, Bikepacking.com, Surly Bikes, and Meriwether Cycles for support. Join Nicholas Carman and Lael Wilcox at The Bicycle Shop on Dimond Blvd. to learn more about the new Baja Divide route, including details of the routebuilding process, maps and images of the route, and a discussion on how to prepare for a successful tour of the Baja Divide. With help from a number of friends, we mapped a nearly 2000 mile off-pavement route from San Diego, CA, USA to the southern tip of Baja California at San Jose del Cabo, BCS, MX, scheduled to be published via a new website this summer. This exciting new bikepacking route crosses an international border, travels both coastlines of the Baja peninsula, through every mountain range in Baja, and even includes a short boat ride across Bahia Concepion to a little used dirt road on the far side of the bay. Encounter remote Spanish mission sites with cool water shaded by date palms, classic tracks from the Baja 1000 moto race, forgotten beaches, and rough mountain roads. The complete route is a big adventure that requires some experience and planning, which we will discuss at this event. What kind of bike to ride, how to pack, how much food and water to carry, are tubeless tires really necessary? A short presentation with images will be followed by a Q&A. Our loaded Baja bikes will be on display. As always, ride a bike to the event for a chance to win some cool stuff from our sponsors. Also, Lael will be leaving town at the end of the month to ride to the start of the Trans-Am Race, so come say hi and bye before she skips town. Join us at The Bicycle Shop on Dimond Boulevard in Anchorage, Alaska on Wednesday April 20th at 7PM. Doors open at 7, talk starts at 7:30. There is a Facebook event page if you want to let us know you are coming. This event is sponsored by Revelate Designs, Advocate Cycles, Bikepacking.com, and The Bicycle Shop of Anchorage. Join us for an evening event celebrating bikepacking, photography, and travel. Ride your bike to The Bicycle Shop on Dimond Blvd. on Wednesday July 16, 2014 at 7PM. Pack the bike as if you were going on a big trip or a little trip, or a trek across town. We’ll have things to talk about. This is the week after the Fireweed 400 and the week before Singlespeed World Championships, so leave a little room in your schedule and invite out of town visitors. The evening will commence with food and drinks and conversation. The program includes a diverse range of presentations including visual displays, stories, and expertise on routes, packing, planning, and photography. Our personal bikes will be on display, packed for adventure. As well, we’ll have an array of Salsa, Specialized, and Surly bikes packed for touring, commuting, and lightweight bikepacking. Free food, beer, and gifts. Eric Parsons will share a personal history of Revelate Designs, including experiences from the trail, and from his years designing gear that works for himself and the rest of us. Eric’s business has grown from a one-man custom operation to a rapidly expanding Anchorage-based company which supports adventurous and accomplished riders across the globe. Dan Bailey will share his expertise as an Alaskan adventurer and professional photographer. His images inspire readers in magazines and commercial media, including recent credits in the Patagonia catalog and advertisements for the new Fujifilm X-T1 camera. Lael and I have prepared stories and a series of printed images from our exploratory summer of bikepacking in Europe. This event happens less than a week before our return to find new routes (and food) in the Carpathian Mountains of Eastern Europe. Come say hi, and goodbye. Thanks to our event sponsors, we will be giving away a load of awesome gear from Surly, Salsa, Adventure Cycling, Revelate Designs, Velo Orange, and Bunyan Velo. 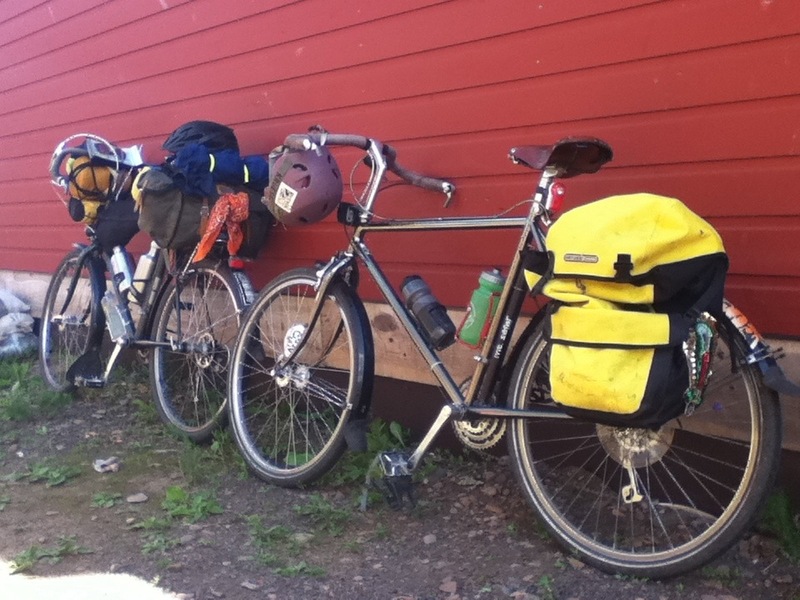 So far, there are steel touring racks, a winter wool cycling cap, lightweight luggage, water bottles and cages and socks and t-shirts and hats and stickers, and a complete Great Divide map set to give away. I will also throw in some maps for the new Idaho Hot Springs Bikepacking Route from Adventure Cycling. Ride your bike to the event for a chance to win! Finn says, get riding over to The Bicycle Shop, Dimond on July 16!